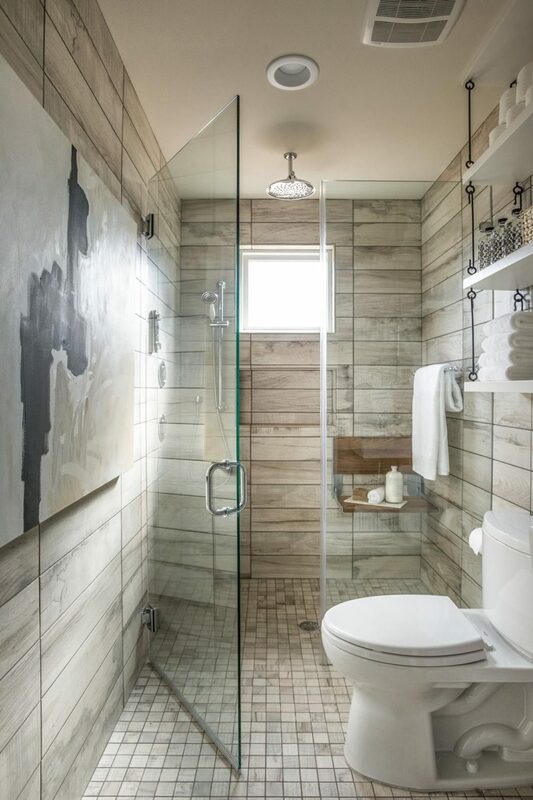 When you think of bathrooms, you don’t necessarily get a clear picture of wood accents in mind. Obviously, water and wood don’t play too nicely together. But, if you really want a rustic or farmhouse-inspired space, there are some tips and tricks – and inspiration – we have up our sleeves. 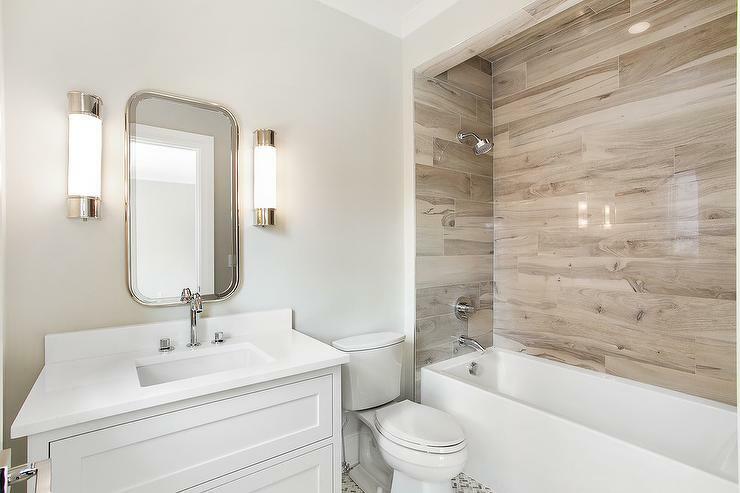 These 15 bathrooms have been transformed with “wood” tile. 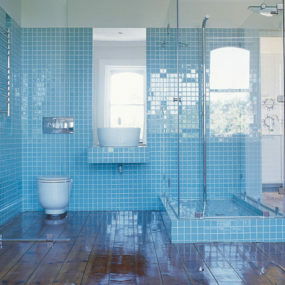 From the floor to the showers itself, these designs (often made of porcelain – or older homes may have actual hardwood floors), will give you exactly what you’re itching for. Housely begins our wood-inspired adventure with this lux bathroom. Not only does the space have a beautiful view, but it blends contemporary style and rustic charm so nicely. The lighter wood is a good choice for when you’re covering this much space within one room. 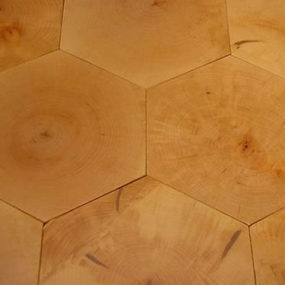 Inside this space, there are two wood-inspired tiles beings used. Small, squares for the floor and larger panels for the wall. Our friends at Homedit featured this beauty before and let us in on its white-washed appeal – perfect for homes with an already farmhouse quality. This sneak peek stole our hearts because we love its innovation. 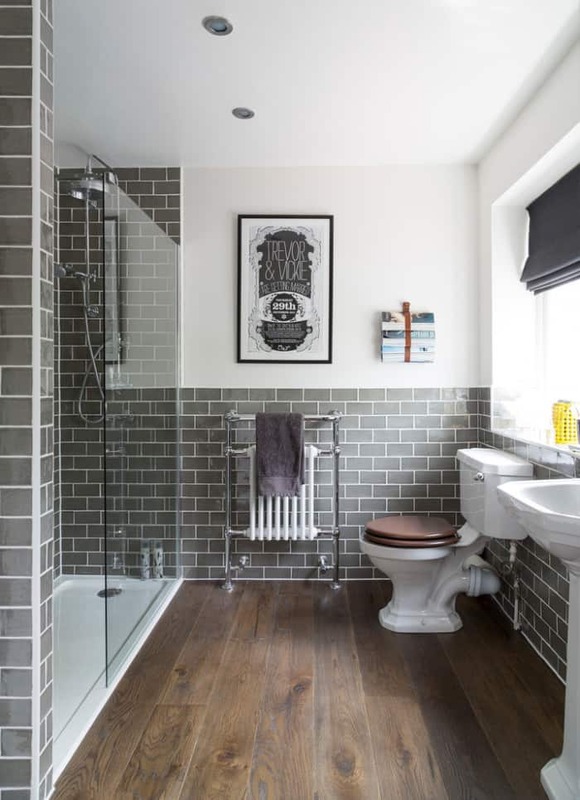 Blending modern and rustic qualities, the wooden tiles and subway designs are such a fun pairing. We found this bit on Pinterest, along with quite a few other snippets that we saved for future revamps. Home Depot gave us this luxurious bathroom to swoon for. 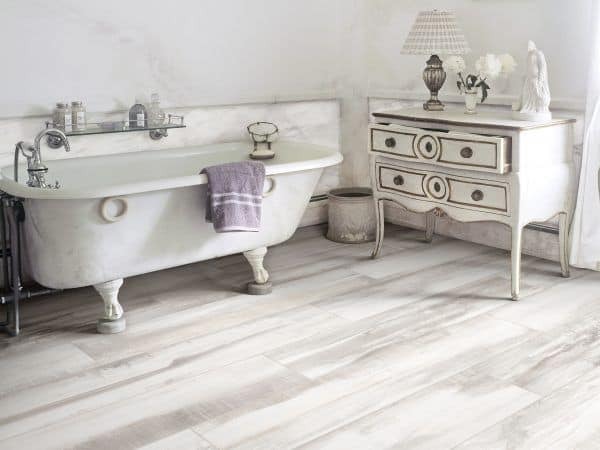 We love the large tiles on the floor and how their light cream tone contrasts nicely with the wood walls. Again, we have a bathroom that’s straight-edged and modern but with a charming rustic quality. How stunning was this light, creamy find from Pinterest? 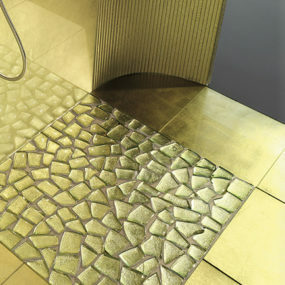 There are varying tile pieces here, but they all pay homage for natural wood pieces. Because they react well to the sun, it has a more feminine quality. Simple white and marble tiles are a nice contract to wood pieces as well. 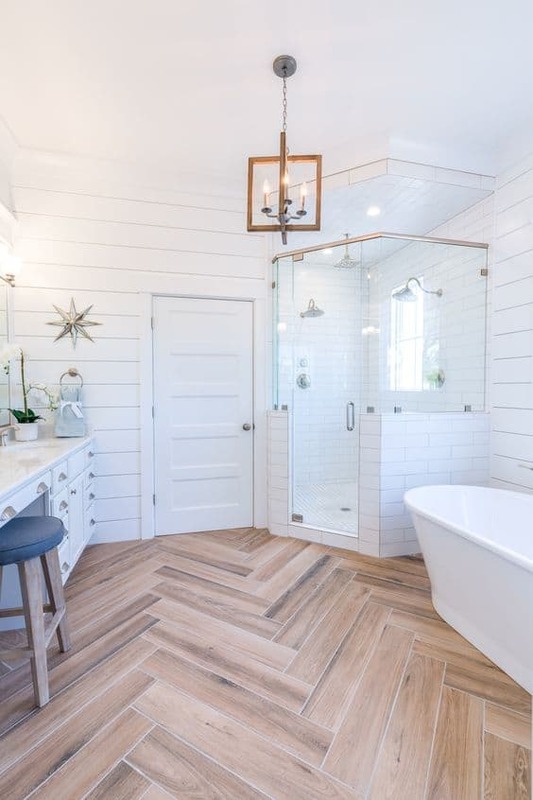 This herringbone floor design from Ali Budd Interiors tops off this contemporary bathroom with a bout of cozy personality. It’s one of our favorite spaces on the list. 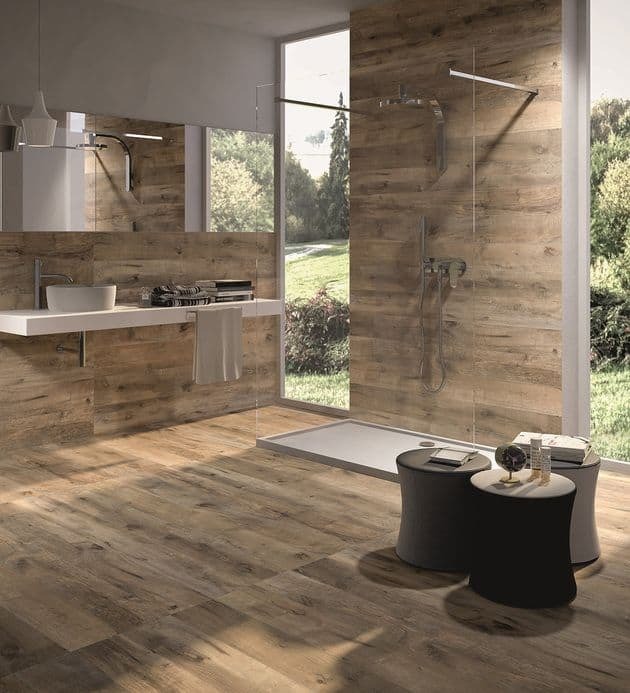 Here’s another example of how wood tile can create a beautiful floor for your bathroom. And it’s a herringbone pattern as well, perfect for those that want to inspire some uniqueness in the master bath or even in the guests’ space. Check out this scene at Progress Lighting. Okay, so this isn’t exactly wood tiling for the bathroom, but it’s definitely inspiring. 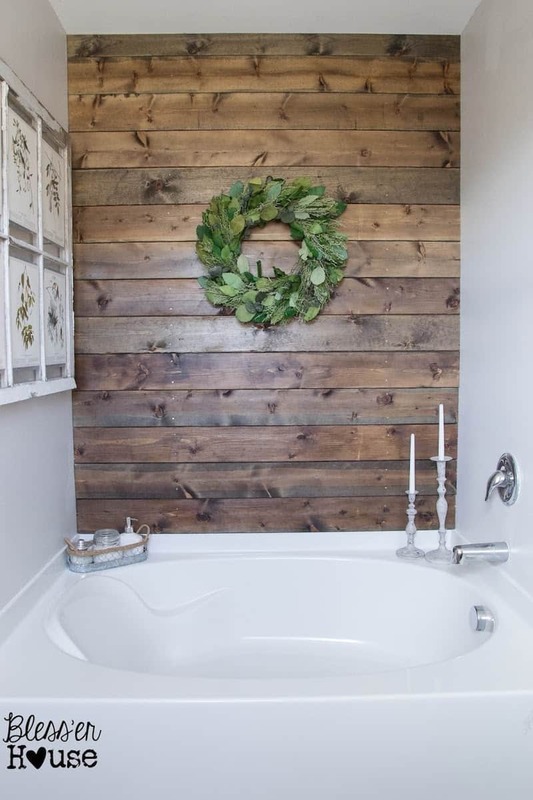 You can create an accent wall above your tub and add a new bout of style that you never had before. Check out the details by visiting Happily Ever After. 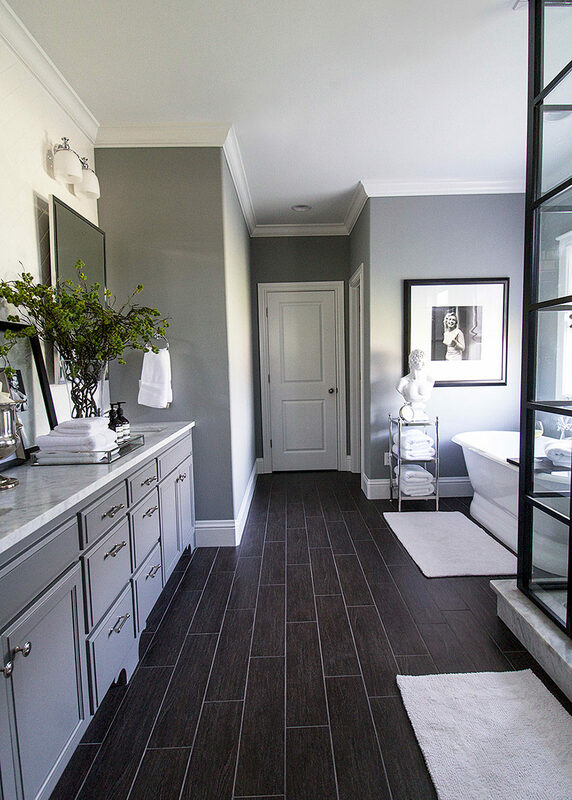 Over at Pottery Barn, we found this traditional space that’s been topped off with dark “wood” tiles for the floor. This is a beautiful design for couple’s or those looking to bring in an more masculine energy. 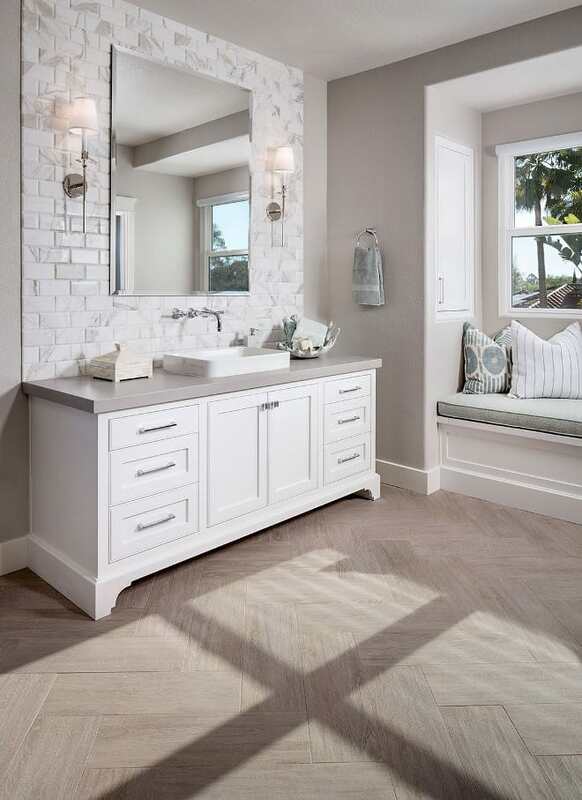 Home Bunch showcased a bathroom that used chunky, marble tile as a fun backsplash and lighter, wood tiles for the floor. Again we see contemporary design and rustic charm come together nicely without any fuss. 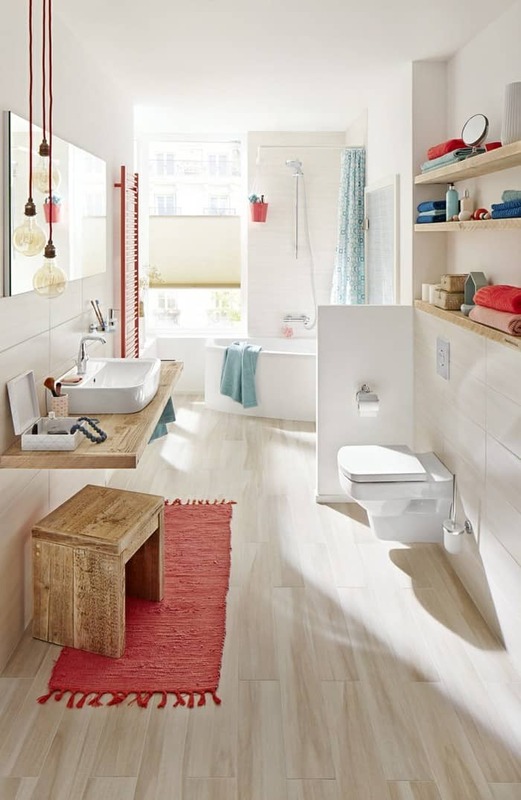 It’s a clean, tidy way to go about designing your bathroom. 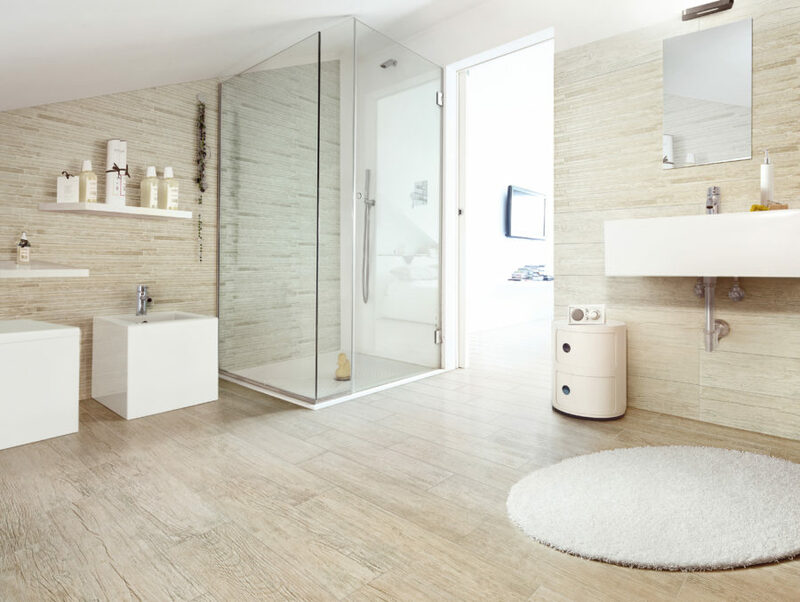 This bathroom has a more natural wood flooring and we love its on-trend appeal. 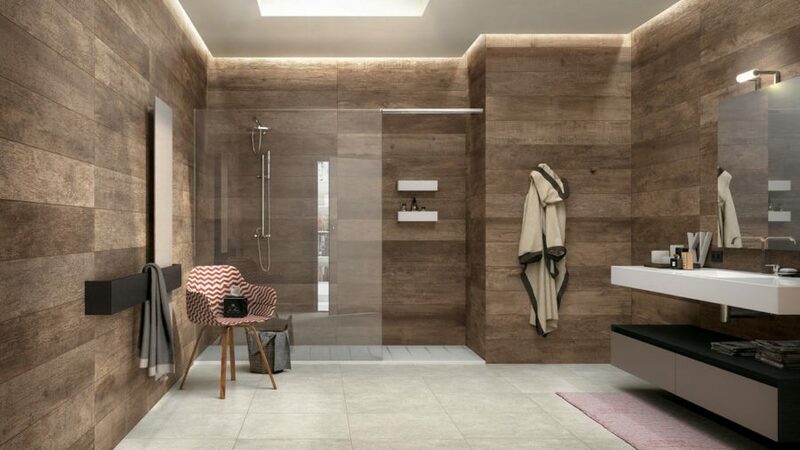 The tile walls and the wood-inspired come together nicely to make an industrial vision that we love. Check out more like this by visiting Kitchen Design Ideas. 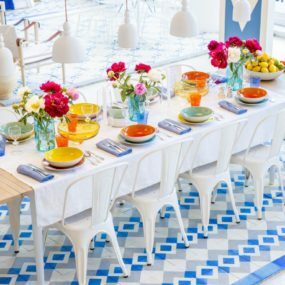 fresh idea went with light wood tiles and pops of color. It’s a youthful, upbeat space that grabs your attention. 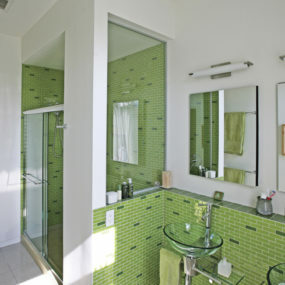 The light colors make everything look chic and clean, perfect for a bathroom! 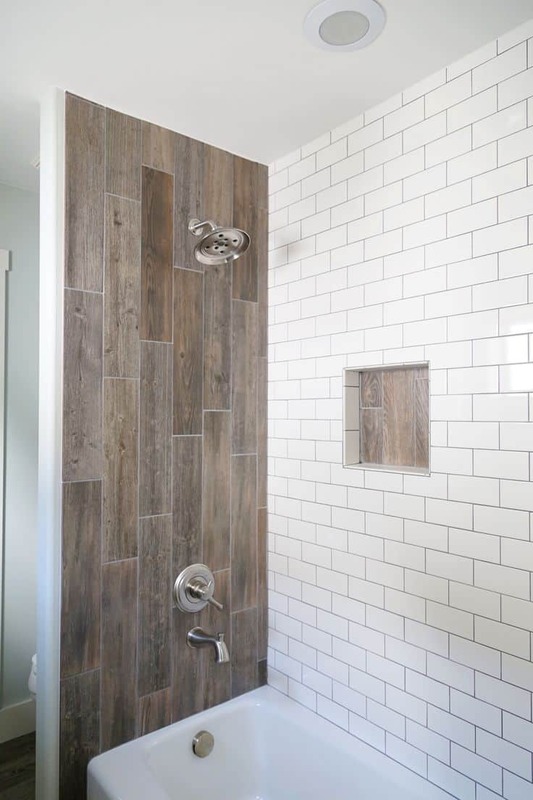 Check out this wood-inspired tile shower we found at Decor Pad. It plays off the crisp whites well and creates just the right amount of buzz for a bathroom. We also love the modern hardware used throughout the area making it more relevant to today’s interior design trends. Even Victorian spaces can handle some wood tiles. 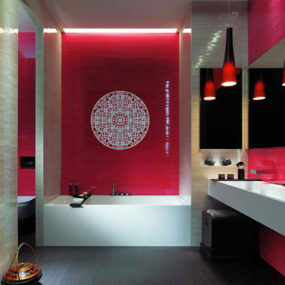 We love the stand alone tub and the feminine quality of the pieces surrounding it. But the whitewashed flooring that Sand & Sisal decided on really caught our eyes. 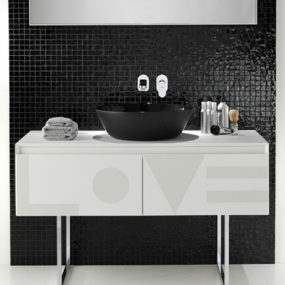 And finally, our friends at Homedit scooped this bathroom up as well and we fell in love. 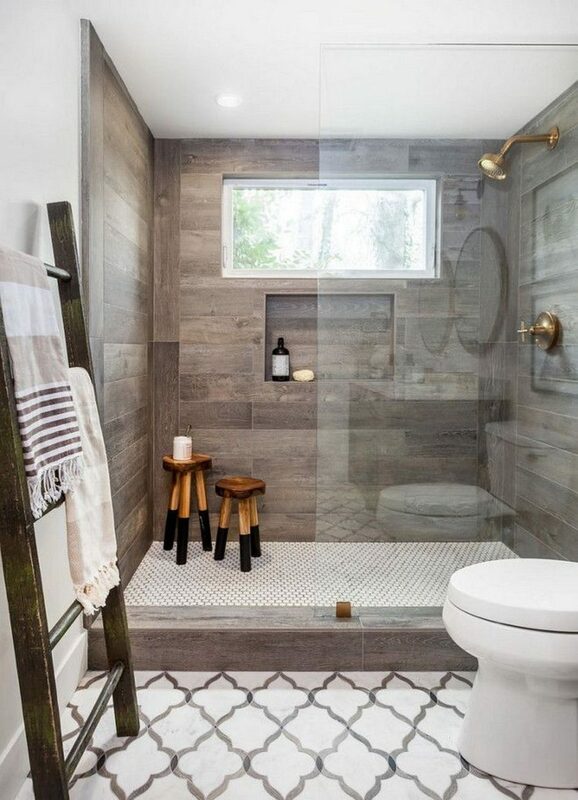 The trellis flooring is a stunner but it’s the combination of that and the wooden tile shower that really made up fall in love. The combination is unique and falls right in line with luxury.